Spring is here, and that means you will soon enjoy cherries and their incredible benefits. In fact, there are many reasons why you should eat more cherries and use them in your recipes, but the major reason is because of their health benefits. I suggest you to enjoy tart cherry varieties, such as Montmorency, to reap all the health benefits of cherries. Without further ado, here are 10 amazing reasons why you should consume more cherries. Consuming cherries helps increase your energy levels naturally. The thing is, the majority of the calories in cherries come from natural sugars, which help boost your mood and increase your energy levels. So, next time you are feeling that terrible midday energy dip, eat a handful of fresh cherries and you will feel much better in no time. If you are prone to sleep issues, consider eating cherries regularly to improve your sleep. Cherries contain melatonin that helps provide better sleep. 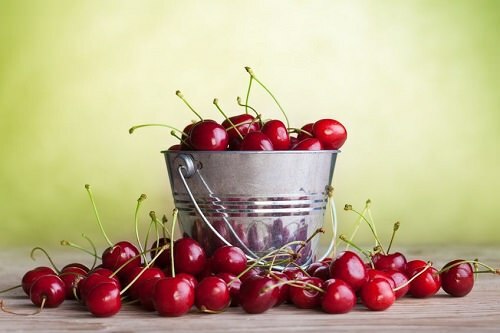 Next time you suffer from insomnia, don’t hurry to take a prescription medication that may have nasty side effects, try consuming some cherries every day and see if they help you sleep better. Another incredible reason to eat cherries every day is because they are great for your eyes. Cherries contain plenty of vitamin A, and a part of this vitamin is beta carotene that helps promote good vision and keep your eyes healthy. Retinol is another part of vitamin A that helps keep your skin healthy. Cherries actually contain about 20 times more Vitamin A than either strawberries or blueberries, so why not eat them more often? Did you know that by consuming cherries regularly, you can fight certain types of cancers? Cherries are packed with natural, powerful antioxidants that lower your risk of cancer and help with healthy aging. This season, consider adding more cherries to your healthy diet. Due to their high fiber content, cherries help improve your digestive system and help reduce your cholesterol levels. Sure, you don’t have to eat too many of cherries. A handful of them will be enough for you since it contains about a quarter of the fiber you need to get in a day. Cherries are a great source of anthocyanins, which can help reduce pain and swelling from different chronic ailments, including gout and arthritis. If you suffer from arthritis pain, try consuming some cherries instead of taking pills, and see whether it works for you or not. Although bananas have more potassium per serving than ripe cherries, not everybody loves bananas, and you can easily get your potassium from cherries if banana isn’t your favorite fruit. Potassium helps ease and prevent muscle cramps, so it’s always a good idea to have some cherries before or after your exercise. You can also drink cherry juice, if you like. Cherries may also help relieve menstrual pain. If you’re feeling a little forgetful, cherries can help to ward off memory loss no matter what your age is. Cherries are known as “brain food” since they are high in powerful antioxidants called anthocyanins, which are great for your brain. So snack on some cherries and improve your brain power. Foods that are good for your heart are always worth eating, and it’s never too early or too late to begin looking after your heart’s health. Consuming cherries can help reduce your risk of heart disease, and overall cherries are good for your health. Isn’t it a valid reason to eat them more? One of the most important health benefits of eating cherries is that they have powerful anti-inflammatory properties. This is great news for runners and athletes, who may be aching after workout, as well as for arthritis sufferers. So, if you’re suffering from this pain now, try drinking diluted tart cherry juice 3 times every day. With a great number of amazing health benefits, it’s impossible to forget about cherries. You can get all those benefits from fresh cherries, or you can opt for cherry juice or dried cherries. When you buy cherry juice, make sure it’s without any added sugars. Do you love cherries? What is your favorite way to eat them?